Employer Dashboard helps you seamlessly manage what’s on your company store. You can post and manage job openings, view applicants, view performance analytics and add team members. And it's done from your Dashboard. 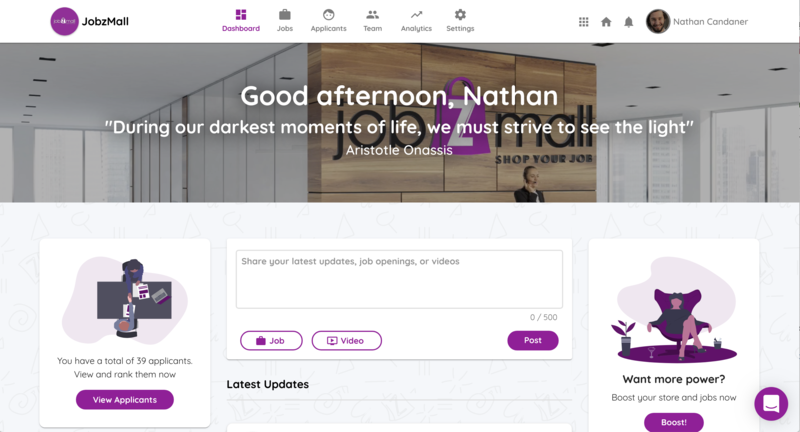 Another unique feature of this dashboard is that it lets you share your latest updates (any videos, announcements and even the latest jobs). This is one of the most effective tools to help you manage your store. Your company is your store window. Make a great impression on each and every visitor. You are more than just a job post. You are a brand. A culture. Impress your visitors with videos and announcements. First off, make sure you are logged in. For further help on how to login to your account click here. Step 1. Click on "My JobzMall" in the header (next to the home icon, it looks like 3x3 boxes). Step 2. After you click on My JobzMall, you will get a list of your stores to navigate to. Click on your store and it will take you to your store dashboard. You can also quickly access your Dashboard from your company store by clicking on the “Dashboard” Icon right next to your company logo. Manage Job Openings: Right next to the Dashboard icon, you will see the Jobs icon. Click on the Jobs icon to help you manage your jobs. You can see all the jobs here (that are currently active as well as those that have expired). The jobs that have expired will reflect in a shaded color. Check out more information on "How to Manage your Jobs" to learn more on adding/editing and removing your job openings. Need more information on how to Edit Jobs? Manage Applicants: This will help you keep track of all the applications that come to your job openings. These are the candidates that have applied to all the different positions that you have posted. Check out more information on "How to Manage your Applicants" to see how you can manage your hiring pipeline. Team: JobzMall is built for you to collaboratively work together with your team. In Team section you can easily manage your team members for your store. Check out more information on "How to Manage your Team" to learn more about giving access to your hiring team. Performance Analytics: You can click on the Analytics icon to get the most for yourself with AI-Driven hiring that takes your hiring to new heights at little to no cost to your business. Get real time Data driven insights. Get state of art insights to your store status. Our data driven technologies give you the most accurate and real time information regarding your store. You have access to know how many visitors you had to your store within the last 30 days. How many people viewed your jobs, how many people applied to your jobs, if you have had any "Direct Apply" clicks. All this and more information is available to you just a click away. Settings: You can click on the settings icon to make the necessary changes to the store. Want to BOOST your store? Click on the right hand side window on the "Boost" icon to gas up! If you want to get more out of your store, Boost it and power up. Attract more visitors to your store and get candidates apply to your jobs. It's all in one place.